Though it's spent a year as an Xbox Live exclusive, Castlevania: Harmony of Despair is now headed for Sony's platform, with a few upgrades in tow. Castlevania junkies will recall Harmony of Despair (henceforth Castlevania HD) as essentially one giant, downloadable mashup of the finest 2D Metroidvania-style Castlevanias of the modern era. It features heroes plucked from disparate timelines and canonical roles, and maps that combine familiar architectural and geographical features from around Dracula's beloved universe. Gameplay-wise, Castlevania: HD is something of a cross between a multiplayer Boss Rush and a timed dash through the decrepit landscape. Liberally borrowing art assets from the majority of its 2D predecessors, Castlevania HD is basically Konami offering Xbox Live gamers a huge dollop of fan service, wherein they could team with up to three friends to kill familiar bosses and those stupid red skeletons that just refuse to die. Now, it's en route to the PlayStation Network. Last year's multiplayer take on the 2D Castlevania bloodline, Harmony of Despair, comes to PlayStation Network some time next month, Konami has announced. It's the same game that launched on Xbox Live Arcade last summer, though PlayStation 3 users get the Beauty, Desire, Situation Dire map pack for free as an added purchase incentive. 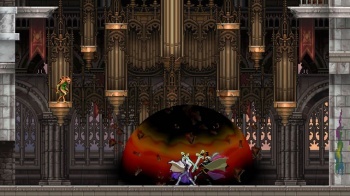 The add-on includes the Pyramid of Ruin level and additional playable characters Julius Belmont and Yoko Belnades. So far there is no word on whether the PSN will also see the host of downloadable content add-ons that are currently available for the title's Xbox Live iteration. While Castlevania HD never really reached the same critical heights as its forebears, it's still a solid game. So, PlayStation gamers, are you up for another chance to whip, stab, and immolate vampires in the name of whatever mutation of Christian mythology Konami is currently favoring? If not, would you be willing to pay cash money to hang out with Alucard yet again?